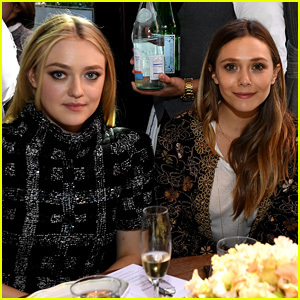 Dakota Fanning & Elizabeth Olsen Are Very Good Girls at Tribeca Event! | Dakota Fanning, Elizabeth Olsen, Grace Gummer, Lola Kirke, Zosia Mamet | Just Jared Jr.
Dakota Fanning & Elizabeth Olsen Are Very Good Girls at Tribeca Event! Dakota Fanning sits next to her good friend Elizabeth Olsen while serving as advisers at the Through Her Lens: The Tribeca Chanel Women’s Filmmaker Program event on Tuesday afternoon (October 17) in New York City. The actresses starred in the movie Very Good Girls, which was released back in 2014. They’ve remained close ever since! Some of the other stars in attendance included Lola Kirke, Zosia Mamet, and Grace Gummer. FYI: Elizabeth is wearing Chanel. Dakota is wearing Chanel. Zosia is wearing Chanel. Rowan Blanchard Is an 'It Girl' with Kristina Bazan!